It also raises he question of an analysis of the altars and monuments from Babylon, Greece and Rome to examine their designs. Likewise, the references in the Greek literature to geometric problems related to areas need to be investigated further for their astronomical significance. Later religious architecture, both in the east and the west, became more abstract but its astronomical inspiration was never hidden. In Europe cathedrals were a repesentation of the vault of heavens. In India the temple architecture, as spelt out in the manuals of the first centuries AD (see, for example, Kramrisch 1946), symbolizes the sky where in addition to equivalence by number or area, equivalence by category was considered. The temple platform was divided into 64 or 81 squares (Fig. 2). 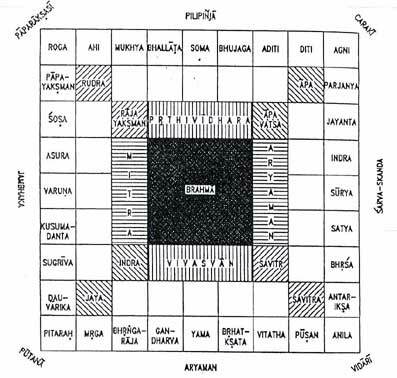 In the case of the 64- squared platform, the outer 28 squares represented the 28 lunar mansions of the Indic astronomy. For the 81-squared platform, the outer 32 squares were taken to represent the lunar mansions and the four planets who rule over the equinoxial and solstitial points. Stell Kramrisch, the renowned scholar of the Indian temple architecture, has also argued that another measure in the temple was that of 25920, the number of years in the period of the precession of the equinoxes. Whether the precessional figure was received by the Indians from the Greeks or obtained independently in not clear.